RHS Wisley staff member looking a little surprised! But what's the butterfly? 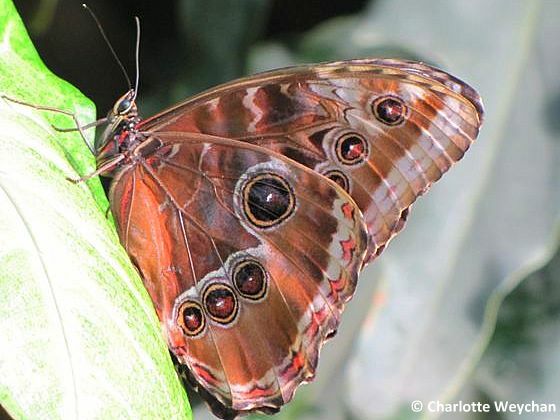 If you want some winter magic, head to RHS Wisley for the Butterfly Exhibition, on until the end of February. It's guaranteed to entertain all ages and provide hours of amusement for both young and old! I went today with fellow blogger Joanne whose cottage garden blog has delighted many over the years. And once inside, we were no different to the numerous toddlers in the glasshouse - entranced by these fluttering creatures and exclaiming at this magical display! 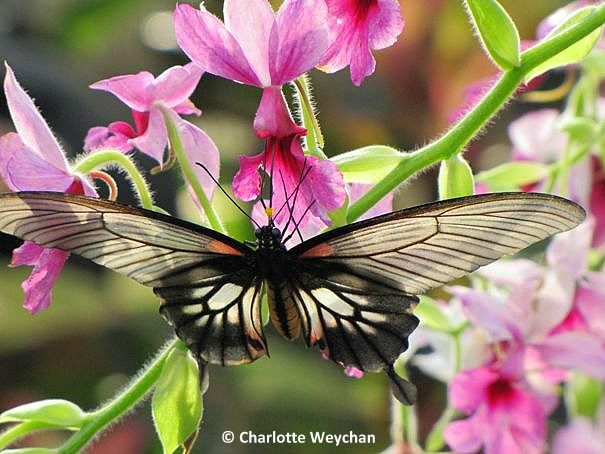 There are some 30 species of butterfly on display at Wisley. We were really lucky with the weather, because the day dawned bright and clear and we were able to see the butterflies in the sunshine, but this is a display that you can catch on a rainy day too and of course, there's always the gardens to enjoy. I'm only featuring some of the butterflies we saw here, but we also saw many wonderful plants on our brief visit today, which reinforces my view that any garden with a glasshouse makes worthwhile viewing in the winter. This exhibition will still be on during Half Term so one to remember if you're looking for something to do with the kids over the holiday period. The glasshouse at Wisley is spectacular at any time of year - filled with tropical plants, orchids, bromeliads and epiphytes, massive ferns and many other exotic plants that you wouldn't normally find here in England. But add the butterflies to this and you've got a really wonderful display. As I write, I'm getting ready to leave for the airport, but I'll be posting from the US and India on my travels in the next six weeks. By the time I get back it will almost certainly be springtime! I'm just completing a list of all those wonderful snowdrop gardens that I'll miss next month, although I'm hoping to glimpse a few on the couple of days I'm home between trips and will be posting this information some time soon, along with news on some of the US gardens that I visit in the next two weeks. 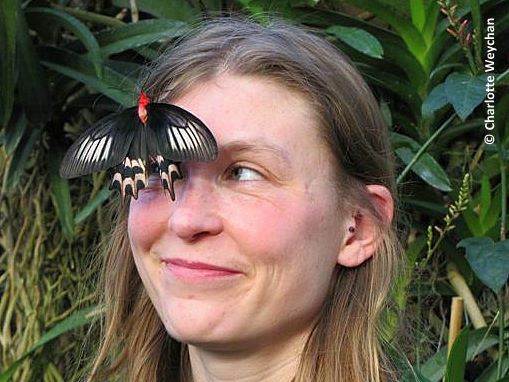 How lovely to be with Joanne and butterflies! Beautiful photos Charlotte! So beautiful butterflies! I had a year when everything in my head is all about butterflies, i even chase them in the property in the province to look for their host plants. But now it somehow faded or lay dormant in the head. We also have that black with red and they are so big and beautiful. They normally eat citrus species. 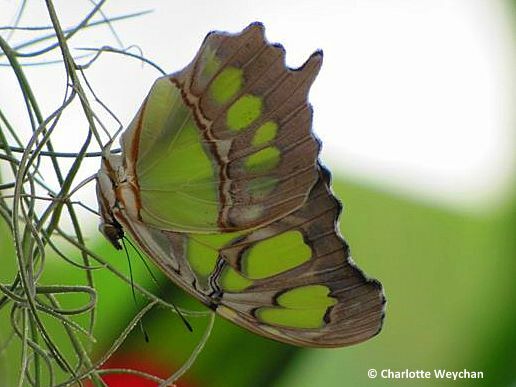 Very nice butterflies, especially the Morpho with open wings. I found that an especially hard shot to get.I almost resorted to shooting a pinned one. Enjoyed this post, good to see a bit of summer this time of year. I have seen the Malachite in southern Texas, very cool isn't it. Safe travels my friend! Looking forward to what you discover along the way. This was a wonderfully spirit lifting post - thank you! The photo of the malachite with the matching designer background is amazing. I'm so envious of your trip to Wisley, as well as Polesden Lacey and the Hilliers Arboretum - all close to our English home (sadly currently rented out, with someone else tending the little garden). Enjoy your trip to the US and India. We used to live in Massachusetts and may be moving to New Delhi, so I shall continue to follow your blog with much interest! Hi Charlotte It was such a treat to spend a couple of hours with you at Wisley, a shame you missed the rest of the garden especially Battlestone Hill which was such a delight. Great first shot!! I was very tempted to post my favourite butterfly shot but it would have snapped your last shot well perhaps not quite up to your standards. When I get round to it I will also post some shots of the Alpine house a treat for your next visit. Looking forward to an update from Florida and India. So pretty! 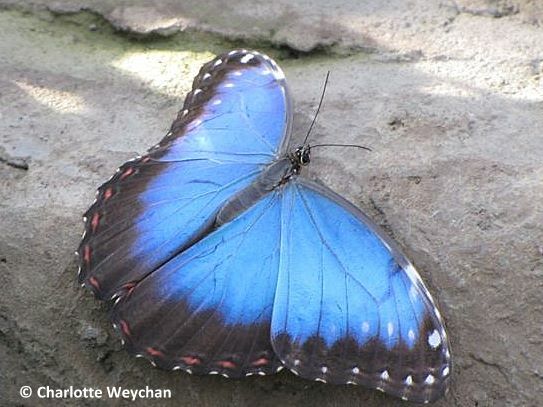 I love that Blue Morpho - its fascinating how the wings are different on the outside and one the inside. Those are great photos Charlotte. I imagine being there in winter must be quite something, the warm humid air, scents of tropical plants and the whirling of butterflies. Knowing it might be snowing outside. I'm a regular visitor to Wisley, I live about half an hour away. 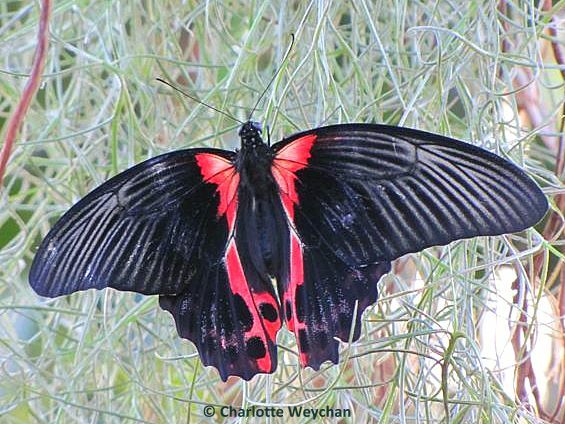 Thanks for the post about the butterfly exhibit. Must make a point to visit next week.